At least three people will tell you how to totally rewrite the sentence from scratch because they think it is "awkward" or "could be better." Of these three at least two will totally be off base because they have no idea what the context of your sentence is, and there's a high chance that at least one will be undeniably worse than the original sentence. Someone will point out how a word in your sentence offends their ethnicity/religious heritage/profession due to something 200 years back in its etymology that you would only know if you were a philologist. Someone will pipe up about how dogmatic reliance on punctuation and grammar is an evil that destroys artist expression because McCarthy didn't use quotation marks so you shouldn't either, dagnabbit. Someone will make an appeal for artistic freedom and say there's no right way to write anything. Someone will take major offense at this last person and say, of course there is! It should be illegal to write any way but this. Someone will give the correct answer to the original punctuation question but by then the author is hiding under the bed crying, so it doesn't really matter. Writing groups aren't evil. They're usually quite helpful and can give us a break from the solitary life of a writer ... and sometimes they'll have some great ideas. And obviously this is an exaggerated satire of what happens in writing groups. 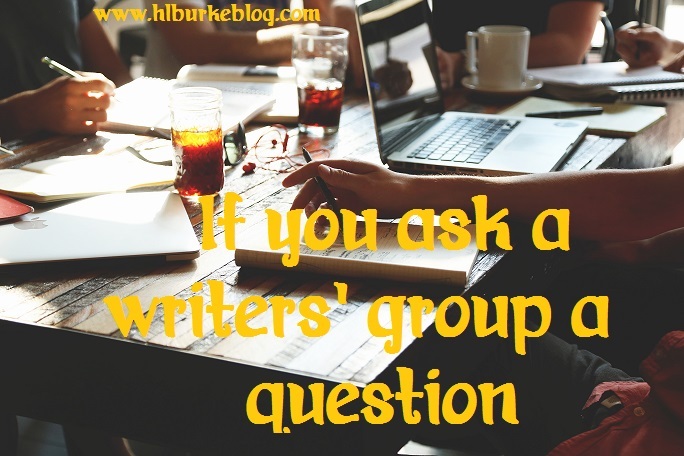 Still, I am in like six different writers' groups ... and all of them have done this at one point or another. I may have even derailed a conversation once or twice myself. While it is amusing to mock, it's what happens when you put creative and passionate minds together, and that's kind of fun to me. However, you do need to learn to be a strong enough writer to take ownership of your work and just ignore advice that doesn't give you what you want/need. Not everyone is at that point psychologically. I was born with an extreme ability to do my own thing no matter what (often to my detriment, admittedly, but when it comes to people trying to get me to do things their way, I'm nearly immune). A lot of people need to learn the skill, though. And sometimes seeing how nobody agrees on a topic is a great way to learn that sometimes you just have to choose and know you won't please everyone. Excellent post! Writer's groups are like this and yes, people need to learn that skill. it's a hard skill to learn especially when everyone seems so sure of themselves or has been doing it so much longer. Writers are mysterious writer beasts.